The CSAPPNH Technical Advisory Group (TAG) is comprised of Prevention Innovations staff, members of partner organizations, and other experts. The role of the TAG is to provide support and technical assistance to our CSAPPNH partner colleges on policy development, and prevention and response planning and implementation. APLU is a research, policy, and advocacy organization dedicated to strengthening and advancing the work of public universities in the U.S., Canada, and Mexico. With a membership of 234 public research universities, land-grant institutions, state university systems, and affiliated organizations, APLU’s agenda is built on the three pillars of increasing degree completion and academic success, advancing scientific research, and expanding engagement. Dr. York joined APLU in 2016 as Director of Student Success, Research, & Policy. He works closely with member institutions to Institutional Leaders together around issues of federal policy and student success. Dr. York provides leadership and strategic analysis for Project Degree Completion, a collaboration between APLU & AASCU in which nearly 500 public colleges and universities have pledged to collectively award 3.8 million more degrees by 2025. Dr. York serves as the staff liaison for APLU’s Council on Student Affairs and contributes to projects, initiatives, and policy analysis related to college student access and success. His research centers on issues of college student access, success, and educational equity; especially as it relates to educational policy. CCSNH is a public system of higher education consisting of seven independent colleges, plus local academic centers. The system is led by a Board of Trustees, a Chancellor, and the College Presidents. Bill Thomas is the Director of Risk Management, System Title IX Coordinator and Chief Information Security Officer at CCSNH. He was previously the Director of Enterprise Risk Management/Senior Account Executive at Cross Insurance and the Risk Manager and Assistant Director of Risk Management and Safety at California State University, San Marcos. Mr. Thomas graduated from Keene State College in 1993 with a Bachelor of Science in Safety Studies. In 2006, he completed his Associate in Risk Management designation from the Insurance Institute of America. He has worked as a university risk manager for over fifteen years. In this role, he has managed university and system insured programs and assisted the campus community in integrating risk management principles into a variety of institutional applications. At CCSNH, he is actively involved in developing preventative Title IX model solutions for non-residential community colleges. He has recently taken on the duties of chief information security officer for the CCSNH. Mr. Thomas was an active member in the CSU system, having worked on such projects as the CSU Club Sports Model and the CSU Service Learning Resource Guide. Mr. Thomas served as a member of the CSU Risk Management Authority’s Board of Directors. Prior to working in the university world, Mr. Thomas worked as a loss control consultant for 10 years with Aetna Property/Casualty and the Beacon Mutual Insurance companies. Mr. Thomas is a past member of the University Risk Management & Insurance Association’s Board of Directors. While working at Cross Insurance he was a member of URMIA’s Affiliate Committee. In addition, Mr. Thomas has served on the 2011 and 2012 URMIA Annual Conference planning committees. He published ERM from the Ground Up: A Grassroots Approach in the 2010 URMIA Journal. Mr. Thomas presented at the Risk and Insurance Management Society’s Enterprise Risk Management Summit in 2010 to share his experience initiating ERM into university athletics and at URMIA’s 2012 Annual Conference, sharing his efforts to integrate ERM into student activities. Mr. Thomas is a member of several professional organizations, including the University Risk Management & Insurance Association (URMIA), and the Risk and Insurance Management Society (RIMS). Mr. Thomas is an active member of the New England Educators Insurance Association (NEEIA) Board of Directors. The Office of the Grafton County Attorney is responsible for prosecuting all felonies committed in Grafton County except first and second-degree homicides. The office also prosecutes misdemeanor and juveniles appeals to the Grafton County Superior Court and conducts grand jury proceedings in the County. The County Attorney’s Office assists police with advice on criminal investigations and with training on legal issues. The Grafton County Attorneys primary responsibility is to see that justice is accomplished. The prosecutor serves the community as a whole and seeks justice for society. Within the Office of the Grafton County Attorney is a victim-witness coordinator whose role is to ensure victims have a voice in the criminal justice process. Granite State College is part of the University System of New Hampshire, and is the system’s choice institution for adults and other college students who value an accessible and affordable education, delivered at local campuses and online. Tiffany Doherty is the Director of Student Affairs at Granite State College. In this role, Tiffany oversees ADA, Conduct, Field Based Learning (Internships) and Title IX. Tiffany joined GSC in 2016 and brings with her more than 14 years of experience managing and optimizing student experiences at colleges and universities across the country. She is currently a member of the New Hampshire Violence Against Women Campus Consortium (NHVAWCC) and the Merrimack County Sexual Assault Response Team (SART). Tiffany holds a Master’s Degree in education and a Bachelors of Arts in Sociology, both from St. Lawrence University. The NHACLEA is an organization conceived to provide a professional forum for directors and administrators of Campus Safety & Police Departments within the State of New Hampshire. Full time Public Safety Administrators of any New Hampshire hospital or institution that offers an educational degree program to include private or public secondary institutions are encouraged to join NHACLEA. Paul H. Dean is the Chief of Police -Executive Director of Public Safety and Vice President for Student and Academic Services for the University of New Hampshire. Chief Dean is a 30 year veteran of law enforcement and holds a Master’s of Science in Leadership and, Bachelors of Science with honors in Criminal Justice Management from Granite State College. Chief Dean is a graduate of the 186th Session of the FBI National Academy in Quantico, VA and The Babson College Command Officer Training program in Wellesley MA. Chief Dean serves as an adjunct instructor for the Great Bay Community College-Criminal Justice and Homeland Security Program. Chief Dean Serves as an adjunct instructor for Texas A&M Engineering Extension Service (TEEX) in collaboration with the International Association of Campus Law Enforcement Administrators Homeland Security Program, as an instructor in terrorism and emergency management related issues. Chief Dean is the President of the New Hampshire Campus Law Enforcement Administrators Association, Executive Board member of the NH Chiefs of Police-Strafford County Representative, Executive Board member of the NH Police Association, Advisory Board member of the FBI National Academy in Quantico VA and, The United States Department of Homeland Security State, Local, Tribal, and Territorial Government Coordinating Council. NHCADSV is a statewide network advocating for laws to protect the rights of survivors. The Coalition is an umbrella organization comprised of 13 member programs throughout the state that provide services to survivors of sexual assault, domestic violence, stalking, and sexual harassment. Marie Linebaugh is the Program Director at the Coalition. In this role, Marie supports the programs team and oversees specialized projects and initiatives of the Coalition. Marie provides support to the Coalition’s 13 member programs by identifying needed resources and training to improve direct service delivery. Marie serves on statewide committees to assist in the improvement of multi-disciplinary response to domestic violence, sexual violence, stalking, and human trafficking. ​Prior to joining the Coalition in 2014, Marie worked in program development and implementation, with specific emphasis in youth prevention based programming. Beyond working in the area of gender based violence, Marie has worked in the areas of family literacy, teen pregnancy prevention, HIV/AIDs, and refugee resettlement. During her time in Pittsburgh, PA, Marie received a Women’s Achievement award for her efforts in youth program development. Marie is a former Albert Schweitzer fellow and a proud AmeriCorps VISTA alumna who resides in Manchester with her husband and daughter. The Attorney General is the State’s chief legal officer and chief law enforcement officer, serving as the State’s lawyer in all civil and criminal cases in the Supreme Court, and is responsible for the general supervision of all criminal law enforcement in the State of New Hampshire. The Sexual Assault Resource Team (SART) Project, established in 2010, supports the coordination of county-based multidiscliplinary teams to improve the response to adults victims of sexual assault, increase prosecutions of reported cases, and hold offenders accountable. SARTs core team members include advocacy, law enforcement, prosecution, and Sexual Assault Nurse Examiners (SANEs). Additional partners at the table including mental health, Bureau of Elderly & Adult Services, probation and parole, faith community, college campuses, Veterans Affairs, and the NH National Guard representatives. SART is also involved in many ongoing statewide efforts including workshops, daylong trainings, the Attorney General’s annual conference, and training at the police academy for recruit officers, as well as, collaborating on several projects with various stakeholders. Kathy Kimball holds a bachelor’s degree in Political Science from Emory & Henry College in Virginia. Since 2010, she has been the Coordinator of the New Hampshire Sexual Assault Resource Team (SART) Program at the Attorney General’s Office. In this capacity, she has been working to develop sustainable, county-based multidisciplinary teams addressing the criminal justice system’s response to adult victims of sexual violence. Since the New Hampshire SART Program began in 2010, twelve teams have developed and are working hard to address many different challenges. In her capacity as SART Coordinator, Kathy has a place at the table with the SANE Advisory Board and collaborates with the statewide SANE Program and many of its initiatives. She has also assisted in updating various statewide protocols for medical providers, law enforcement and other multidisciplinary professionals to guide their response to those who have experienced crimes of personal violence. In addition, Kathy is working on other statewide initiatives including a committee developing a protocol for media contacts in sexual assault cases, as well as, another committee addressing sexual assault evidence collection kits in NH that have not been submitted to the forensic lab for analysis. Prior to Kathy’s position as NH SART Coordinator, she served 23 years with the New Hampshire State Police and retired as a Detective Sergeant. The majority of her career was spent serving the many communities of Hillsborough County, both on uniformed patrol and as a detective. She also spent 10 years as a D.A.R.E. Officer and was assigned to the Major Crime Unit. In addition to her State Police responsibilities, she was a member of the Attorney General’s Task Force on Child Abuse and Neglect. She served on both New Hampshire’s Child and Domestic Violence Fatality Review Committees. She has also served as a member of the NHCADSV Board of Directors. She has been an instructor at the New Hampshire Police Academy for the past eighteen years teaching courses on both adult and child sexual assault investigations to recruits, part-time officers and full-time certified law enforcement officers. She has also instructed trainings and workshops on these topics for multidisciplinary audiences in NH and ME. 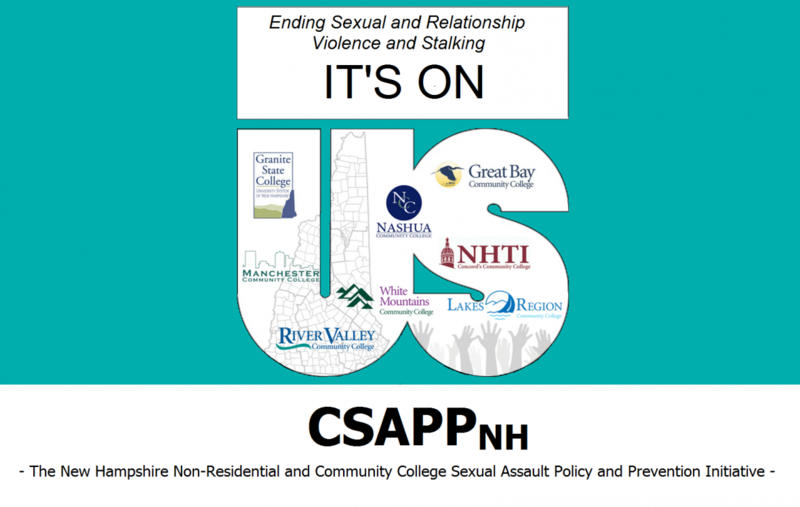 The NH Coalition Against Woman Campus Consortium provides a forum for professionals from colleges and community organizations to discuss, develop, and implement strategies to end sexual and relationship violence and stalking on their respective campuses. The NH Campus Consortium Coordinator is responsible for providing administrative support, outreach, resources, and technical assistance, and for encouraging collaboration with community partners. As the New Hampshire College Consortium Coordinator, Kitty Kiefer helps NH colleges and universities build their capacity to respond to sexual and relationship violence and to enhance the relationships among campuses and their community partners. She coordinates and supports the work of the New Hampshire Violence Against Women Campus Consortium by providing administrative support and leadership for the Consortium and many of its efforts, conducting member outreach, helping to facilitate resource sharing among members, and representing the Consortium on statewide committees and initiatives. Along with organizing the day-to-day operations of the Consortium, she also provides technical assistance, informational resources, and training to New Hampshire colleges and their off-campus partners. She encourages on- and off-campus stakeholders to strengthen their relationships through cross-training, SART participation, and developing and enhancing collaboration and coordination strategies. Kitty has been involved in the movement to end sexual and domestic violence for several years, beginning as an intern and crisis line volunteer while still in college, and working for nine years as an advocate and Education and Outreach Coordinator at one of NH’s 13 crisis centers. Prevention Innovations Research Center at the University of New Hampshire is comprised of a team of researchers and practitioners who work collaboratively to develop and evaluate prevention strategies, evidence-based measures to document problems of sexual and relationship violence and stalking, and comprehensive community tools to effectively address the causes of violence. Their work is nationally and internationally recognized for its contributions to the prevention of sexual and relationship violence and stalking and has made significant contributions to scholarship, programming, and policy making in the field. PIRC’s research and prevention efforts emphasize the importance of using a community and bystander focus while examining the continuum of violence. Dr. Draper is an Assistant Professor in the Department of Communication at the University of New Hampshire. Her research examines the complexities of authenticity, privacy, identity, and reputation in the digital era through frames of cultural theory, critical institutionalism, and public policy. Her work explores how identity, particularly gender, race, class, and sexuality, shape experiences of privacy, surveillance, and visibility in a digital environment. Her work has been published in the International Journal of Communication, Critical Studies in Media Communication, the Journal of Children and Media, and Surveillance & Society. Rebecca Howard is a Project Manager whose work focuses on college sexual violence prevention and response. Prior to receiving her M.A. in Justice Studies from UNH, Rebecca worked for the Manchester, NH Police Department as a victim/witness advocate in the Domestic Violence Unit. She is an avid writer, runner, traveler, and animal enthusiast. Becca Ludecke earned her B.S. in Psychology from Western New England University in Springfield, MA and her M.A. in Justice Studies from the University of New Hampshire. She began working at PIRC while completing her graduate studies and also worked with the New Hampshire Coalition Against Domestic and Sexual Violence as a Legislative Intern during this time. She is now employed at PIRC full-time, working with the PIRC communications team, on marketing for uSafeUS, and on various PIRC research projects. She has a passion for social justice, public policy, and politics, especially as they relate to sexual and relationship violence prevention and response. In her free time, Becca enjoys reading, crafting, cooking, and exercising. Dr. Potter is the Co-founder and Executive Director of Research at the Prevention Innovations Research Center: Ending Sexual and Relationship Violence and Stalking at the University of New Hampshire and Professor of Sociology. Dr. Potter’s research focuses on engaging community members to work collaboratively to reduce sexual and relationship violence, stalking and harassment. She has been a leader in the development, dissemination and evaluation and of the theory- and research-based bystander intervention prevention strategies including the uSafeUS mobile app and the Know Your Power® Bystander Social Marketing Campaign that models pro-social bystander behaviors that has been shown to be effective for both campus and military audiences. She has been awarded research funding from competitive sources including the US Department of Justice, Centers for Disease Control and Prevention, Department of Defense, National Institute of Justice, National Science Foundation and Verizon Foundation. Her research has been cited in international and national news media including the Guardian, New York Times, National Public Radio, Vox, Glamour Magazine, Teen Vogue and Chronicle of Higher Education.